It's come time for my traditional countdown of my favorite twelve images from the previous year. 2017 was a good year for photography, despite my third (and final) year of wood thrush field work taking up much of my time between the end of April and the beginning of October. As usual, there were some tough choices to be made to narrow it down to just twelve images. Here are my favorites from this year, in no particular order. 1. "Placid Lake, Turbulent Skies"
This image was taken near the top of Whiteface Mountain looking down towards Lake Placid during peak foliage at the beginning of October. At the end of our annual camera club trip to the Adirondacks, a group of us decided to take the drive to the top of Whiteface. Despite iffy weather and a small traffic jam at the entrance, our perseverance paid off more than we could know. At the top we were treated to windy and frigid conditions, but also incredible views of the surrounding foliage and mountains with light beams breaking through the stormy cloud cover everywhere. This image is a panoramic composed of seven vertical images taken with my 70-300mm lens set at 70mm. Each of those images was in turn created from a 32-bit HDR made in Lightroom from three identically composed images shot at 1 stop increments. I turned off Auto-Tone and processed the 32-bit images manually. All images were shot at f/16. Obviously to pull this off, all images were shot on a tripod in quick succession. I encountered this relatively small alligator sunning itself along the dike at the Audubon Swamp Garden in Magnolia Plantations and Gardens near Charleston, SC. The behavior depicted is called "gaping" and is likely a thermoregulatory behavior. 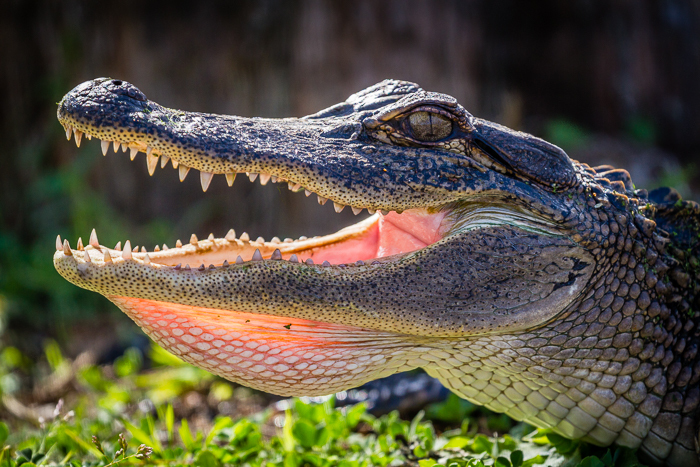 The alligator rests with its mouth open and often the buccal pouch extended. This individual was nicely backlit; illuminating the translucent skin of the pouch. With the benefit of almost the full reach (with a 1.6x crop factor camera) of a 100-400mm zoom lens, I was able to carefully get down to eye level to photograph this individual. 3. "Broken Dancer No. 3"
2017 was a great year for my night photography, although mostly with less natural subjects. 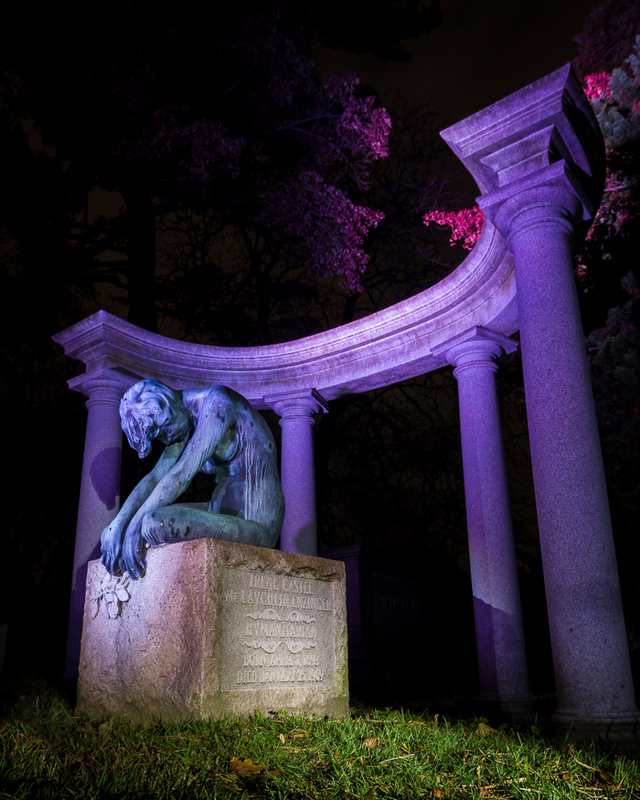 One of my favorite locations for night photography this year was Woodlawn Cemetery in the Bronx. This cemetery has a large collection of historic, elaborate, and artistic mausoleums and monuments. Although I captured a few images here that made it to the candidates for favorite of 2017, this image is far and away my favorite of the bunch. This image was light painted with the help of my friend Peter Nagy. I'm photographing with my tripod fully spread, lying on my belly on the ground with my Tokina 11-16mm lens. There is a powerful pink/magenta colored light pointed at the front of the statue. I'm using a spotlight from the ground to light the writing on the block and fill in some of the detail on the side of the dancer and remove some of the color cast on the statue. Peter is holding a small spotlight on the hands to emphasize the hands and remove some of the color cast from that area as well. Irene Castle and her husband were a famous dancing couple and when he died during a wartime training accident, she had this statue commissioned for his marker. I captured this macro image late one evening in July near Swan Lake in Rockefeller State Park Preserve. 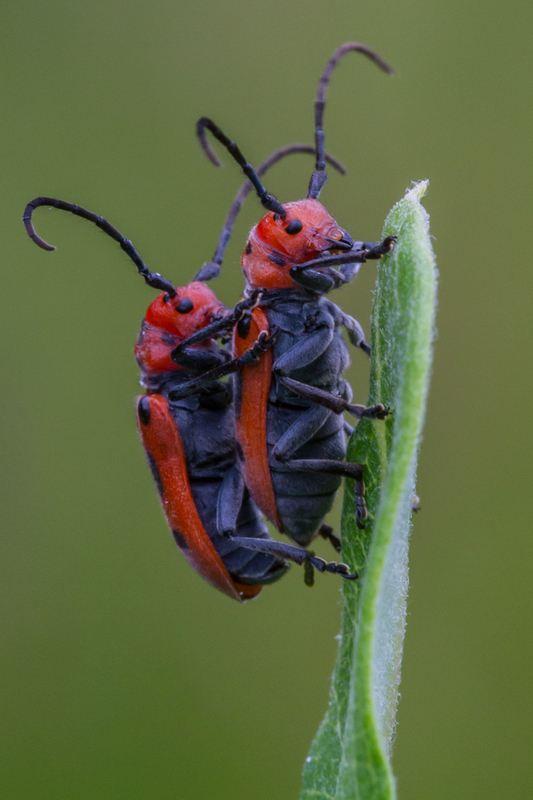 I went to this patch of milkweed plants looking for macro subjects and this pair of red milkweed beetles obliged. I love the contrast between the bright red beetles and the green surroundings. The red and black coloration warn potential predators of their foul taste due to toxic cardiac glycosides obtained from the milkweed plant. In an example of Mullerian mimicry, many of the insect species feeding on milkweed have a similar red/orange with black pattern. 5. "Me And My Shadow"
This image was captured at Nickerson Beach Park on Long Island. I was thrilled to finally capture some images I was happy with of this beautiful and charismatic bird. This image is one of my favorites because the combination of behavior, a parent bringing food to its young, and the perfect shadow, elevate this image beyond the standard animal portrait. 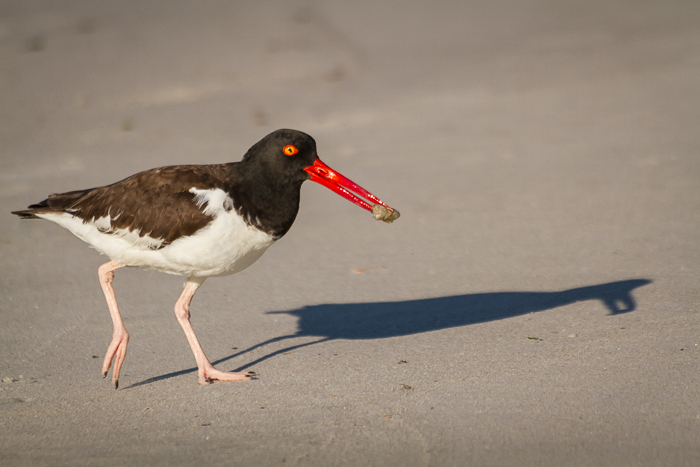 This individual passed close by me on foraging runs several times as I sat still and quiet on the beach front. While the lighting may not have been ideal, any time you catch a baby owl out and about during the daytime has to make the favorite list. This baby screech owl was waiting in this beech tree with its parents for the rest of its siblings to fledge from the nest. 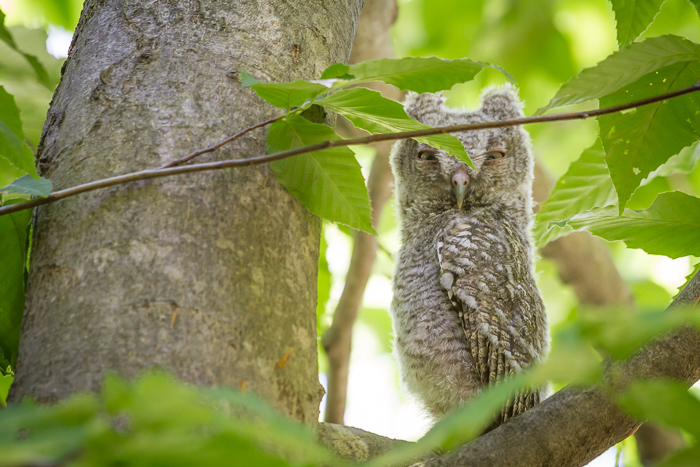 It was soon joined by two other baby screech owls in the same tree. Taken mid-June in Rockefeller State Park Preserve. 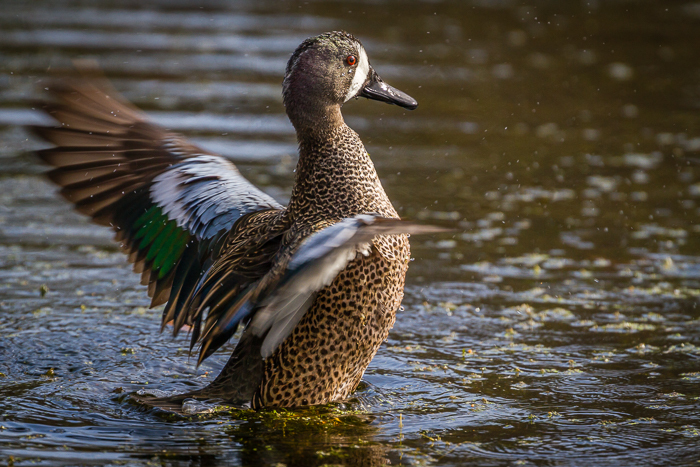 This displaying blue-winged teal was displaying in February at the Audubon Swamp Garden at Magnolia Plantation and Gardens. I love the blend of frozen detail (particularly the eye) and blurred action in this behavior shot. Just enough detail is captured in the pale blue, white, and iridescent green wing feathers to show the structure of the colored wing patches. Because of hunting pressure, it can be hard to get good images of these ducks, so it was great to find wild ducks that were mostly habituated the hustle and bustle of the busy plantation. 2017 also saw many new additions to my "Fairytales" composite series. "Gaea Overwhelmed" is one of my favorites because of its environmental message and the overall visuals. 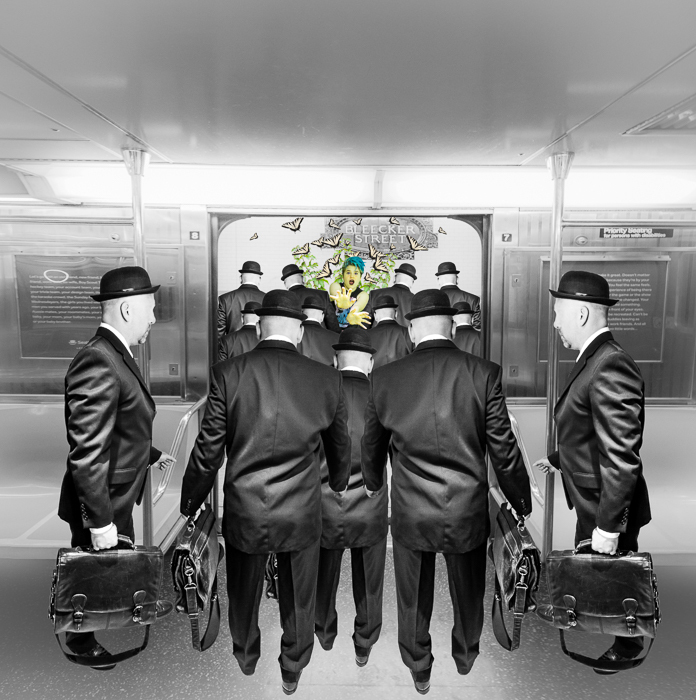 I originally conceived this image and shot the background subway image back in April. But I didn't finish getting the background image into shape and photographing and adding the figures until October. As with all the images in this series, I've tried to layer multiple meanings/interpretations and social commentaries into the fairytale story and mix in modern elements to indicate their modern relevance. 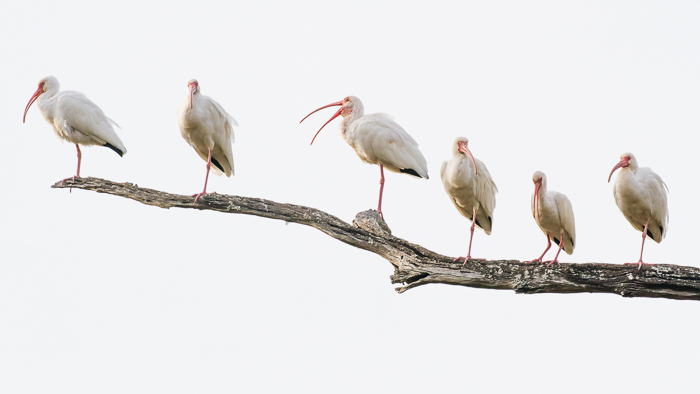 This line of white ibis was also photographed in the Audubon Swamp Garden at Magnolia Plantation and Gardens near Charleston, SC. I noticed the birds lining up on the branches of this dead tree, but then it was a matter of finding a viewpoint that wasn't obstructed by other vegetation, but allowed me to capture the linear arrangement. The overcast sky provided a nice high-key effect. 10. 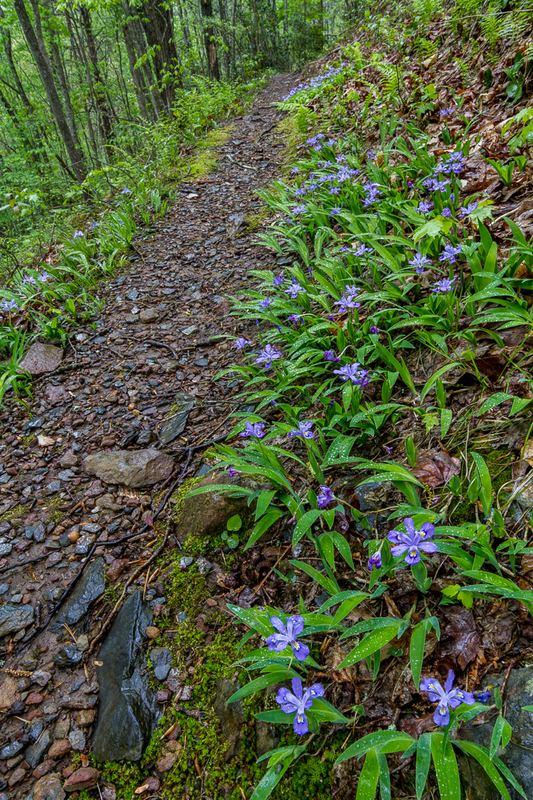 "Crested Dwarf Iris And Trail, Little Frog Mountain Wilderness"
During 2017 I also continued to work on my "Smallest Wilderness" project; revisiting some local wilderness as well as areas in South Carolina, Tennessee, and Virginia. This image was made just inside the Little Frog Mountain Wilderness in Cherokee National Forest just after a light rain. Crested dwarf iris are among my favorite wildflowers and I love their saturated green and purple colors. During my work on the "Smallest Wilderness" project I also visited the small but stunning Gee Creek Wilderness in Tennessee. A combination of waterfalls and wildflowers made this wilderness a joy to hike. 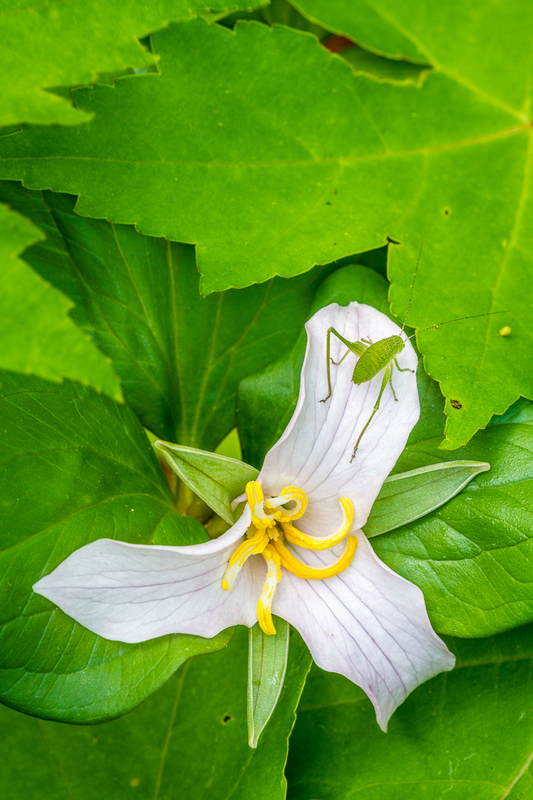 The combination of trillium with the spring maple leaves and a katydid nymph combine to elevate this image above the "standard" wildflower close-up shot. 12. "Fall Ring Cycle No. 2"
2017 also saw the development of a new series that I'm very excited about. "The Shape Of Things" series takes elements from my nature photography and turns them into pieces of digital art that in addition to being beautiful also illustrate concepts of morphology, seasonality, cycles, and the passage of time in the natural world. 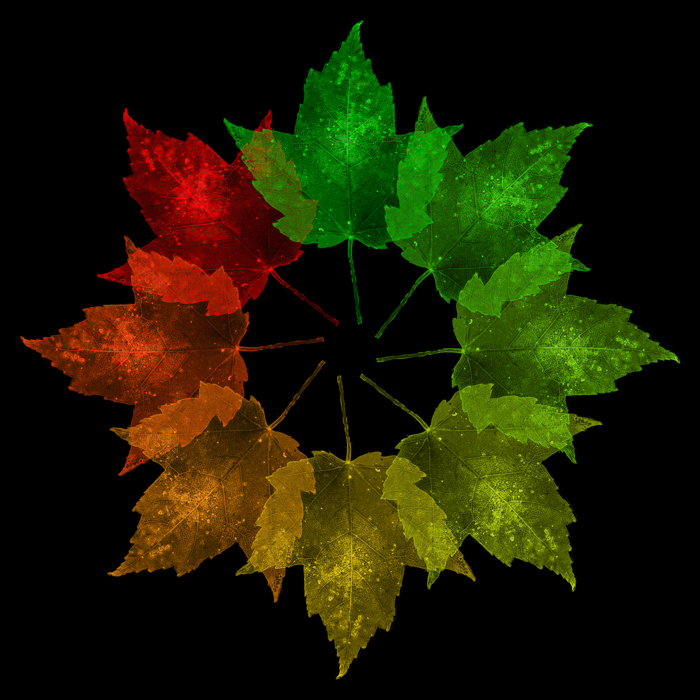 This image is one of my favorites depicting the cycle of color change in foliage and the seasonality of the natural world. To see more of this series and my other composite, night, and digital fine art work, please visit my new website at https://whimbrelnature.myportfolio.com/work . Happy New Year to all! Wishing you the best and lots of outdoor adventures in 2018! Great work Eli. Grateful that you share these wonderful pictures/ works of art!